Motorola is prepping to announce a new smartphone under brand new series alongside the Moto E4 and Moto E4 Plus. The new smartphone will be dubbed as Moto C and will be the cheapest Moto phone till date, according to various leaks. 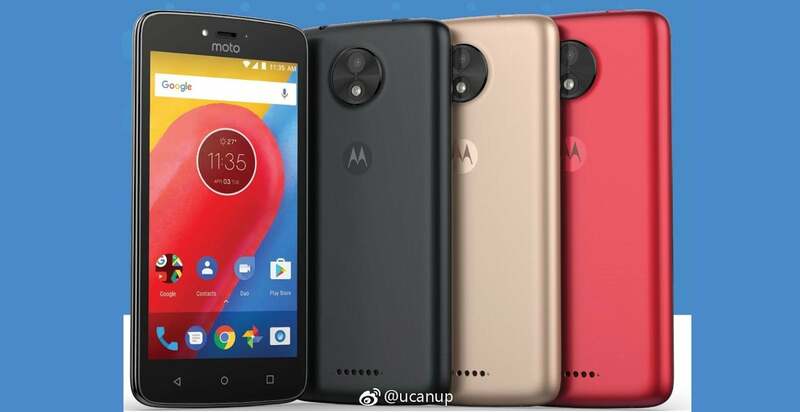 Today, a tipster (@ucanup) has posted an image of the upcoming Moto C in different colours in Chinese microblogging platform, Weibo. In the picture above, it is clearly evident that Motorola is following a traditional design every year and for this year, the company will use the Moto G5 design language on all their phones. The Moto C pictured above will feature a camera bump at the rear, same as the Moto G5 Plus and also feature rear bottom faced speakers, which is a letdown, but acceptable though. The phone will come in three colour options- black, gold, and red. Unlike other Motorola phones released till date, the Moto C will feature hardware navigation keys. As of now, there are no details whether the phone is made up of metal or plastic, but considering it as a low-end device, Motorola might go with the plastic body. In terms of specifications, the Moto C is said to pack a 5-inch FWVGA display with a resolution of 480×854 pixels. Motorola is looking to power the device by MediaTek MT6737M chipset, clubbed with 1GB of RAM and 16GB of internal storage. Camera wise, the Moto C is expected to sport a 5MP rear camera with assistance for LED flash. Up front, the phone will get a 2MP camera for selfies and video calls. Also, there will be a removable 2300mAh battery powering the phone, and it boots Android Nougat out-of-the-box. The Moto C is expected to be priced cheaper than the Moto E4 series, which are due to release shortly. If the rumours are believed to be true, the Moto C will be priced between $50 (approx. Rs. 3,300) and $80 (approx. Rs. 5,200). Motorola might bring this smartphone to India as well to compete with new Chinese brands such as Lephone and iVoomi, but the launch date is still unknown.